You never have to worry about parking. We have our own parking lot with over 80 parking spaces and special take out parking up front. There are two bus stops close by on Stevens Creek/Blaney. Enjoy great I music every Friday and Persian music on Saturdays and belly dancing starting at 8:30pm. If you like to be away from it all, no problem! We feature private rooms as well to be away from it all in your own private setting. We offer Catering for all your special occasions. Whether it be just appetizers, our delicious wraps, kebabs, pasta specialties or seafood. Let us handle all of the details from set up to making every detail a memorable one. 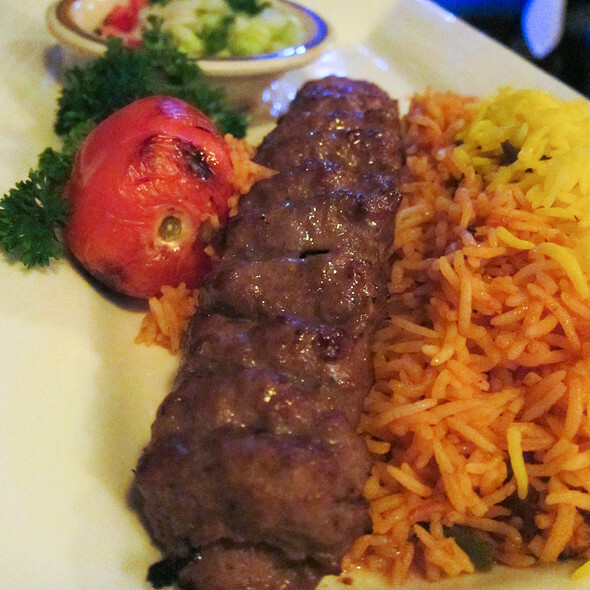 We offer many specialties from our Italian menu to our Persian Menu. We also deliver. Saturday Nights, Dinner & Show menu, $39.95pp 3 Course dinner. We proudly serve Halal Meat / Corkage fee $20 per bottle. Treat mom to a special Buffet Style Brunch or Dinner with us! Allow us to pamper her! Buffett style Brunch Champagne Brunch to include all her favorites, Breakfast, appetizers, fruit display, kabobs, pasta, seafood, dessert & more. Good Persian Music, Belly Dancing, friendly staff and not in a hurry to throw us out ( non-rushed service)! Manager was super accommodating with our few extra requests, service from Carlos was outstanding, and the food/drinks were all loved by my lady and her friends. Will definitely be coming back when we have more time. Note to future guests: if you book your reservation for the fixed menu / entertainment Saturday, don’t make the mistake I made of making plans an hour and a half after dinner. Though that’s usually enough time to eat/enjoy/converse, I wish i would have allowed us more time to partake in the singing/dancing festivities! Service and food was great. Good food, nice atmosphere, servers try hard. An enjoyable experience. We went there in a group of 4 to have diner before a Persian event . We ordered soltani, barg and salmon kabab. and appetizers. The food was very average but the price is really high for what you get comparing to other Persian restaurants in the area. The food was *not good* the barg kabobs were overcooked and rubbery . The appetizers was not good, and bread was cold. In addition we asked for some onion but after 15 minutes the server brought us a little onion which was frozen.I was completely disappointed . 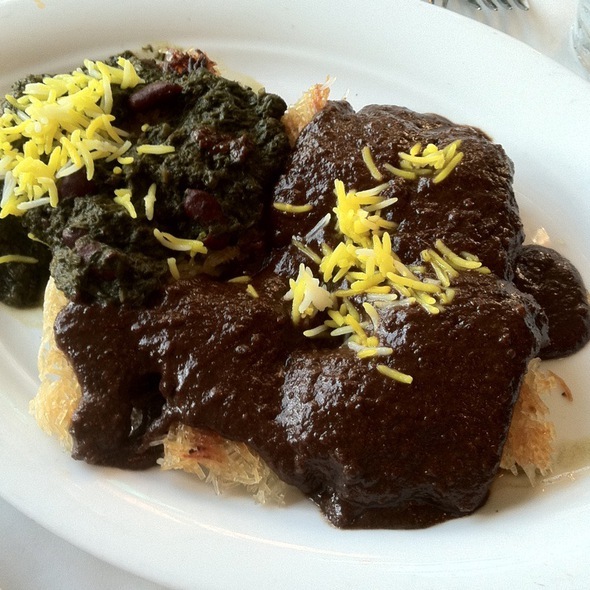 Best fesenjoon chicken in the Bay Area! We didn’t know on Saturday there would be a fixed menu and not get a choice. I made a reservation with opentable for indoor seating. Yet they made me seat outdoors. Upon request to seat indoor they tell me that indoor all tables are reserved. When I tell them that I did reserved for indoor the manager gives me long speech and tells that I need to add special notes while reserving that I need indoor table. He was trying to explain me how opentable app works. This was pretty embarrassing. Food: Late Late Late ... we ordered a salad and kabob combo. It took them 1.15 hr to service the food. Chicken kabob was tastelesss and chewy. Not sure on the freshness of meet. Drink: would not recommend taking cocktails. We had mai tai , long island razzberitinni.. I had better cocktails with cbeaper price. Summary : Not recoomended for date. Great food, music, and drinks. Great customer service! Good middle eastern food. We used the buffet due to time, and it was good. Best about it was how quiet it was, and the service was good. Great food and ambience! We will come again! I liked the fact the music was from different regions. We had a blast. The food was delicious and the belly dancer was an added bonus. What fun. Very normal dishes at elevated prices. Kebabs lag authentic seasoning, everything wery downgraded and smooth flavors wise.Not the tipical Persian experience one would expect! I have been to Arya several times for lunch and the food has been great. We went for dinner for the first time and the quality & taste of the food was unsatisfactory for all 4 dishes we ordered. We attended on a Saturday evening for food and a show with out of town company and was extremely disappointed. We've been to this restaurant many times over the last several years and was happy with everything, but never been for the Saturday show. We will not be attending the Saturday show again. The web site should indicate that there is a special menu for the Saturday evening. We looked at the website and our out of town company was excited about ordering steak. Steak was not part of the Saturday only menu. The view of the belly dancer did not exist for most of the restaurant. Only if you were at a table right next to the floor stage. She should of been on an elevated stage. Our waiter was terrible and we informed the management of that, then got our checks thrown on the table! Excellent food and service.,,the location is easy to find and parking is convenient. also the price is reasonable. The Red Velvet Salmon and Lamb Kebab were both delicious! Great food and drinks. The waiter was awesome. The person who brought the chutney said he'll bring the bread to go with the chutney but never showed up again. Someone else handled the bread. Grilled food with just plain rice is a little dry. Could use some tzatziki/yogurt type of sauces to go on the side. 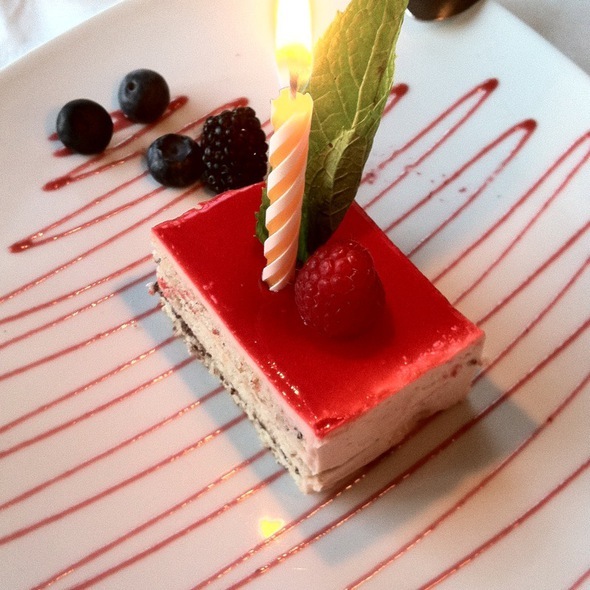 The food was fantastic and the service outstanding! Our servers, Natalie and Nick were attentive, knowleageable and fun! Like another reviewer said, definitely order the lamb chops!!! 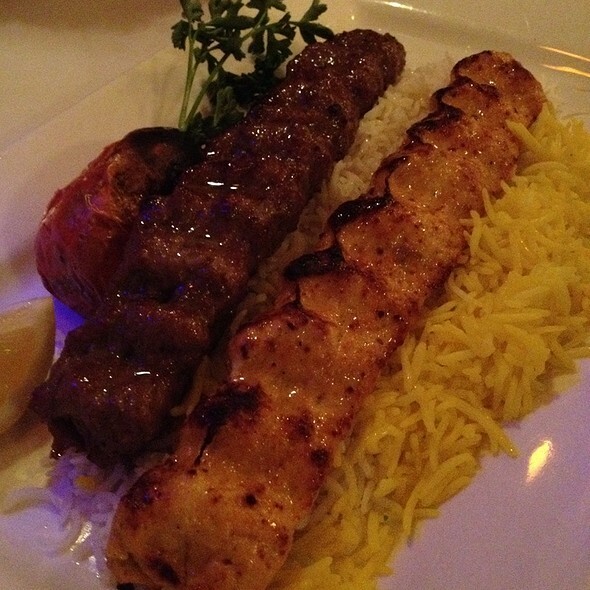 Delicious kabobs and warm bread!!! Service was great and plenty of parking. We have been many times to Arya and always enjoy it. It's a good place to take visitors because of the varied menu. Everyone can find something to suit their palate. It's a comfortable restaurant with good food and service. Left my briefcase there . Can you please call me ? great food, service and entertainment! Everything was great from the start. Our waiter went out of his way to bring me tasting of a flavored rice dish without me asking for it. The presentation of everything we ordered was really nice. Lots of good food. Desserts were delicious. We came here for my birthday dinner, but there were a couple of other large parties. There was a wedding that literally took over the restaurant, dance floor, hallways, everywhere. If they wanted to have their wedding at this place, they should have booked it and paid for it. But instead, we all had to pay for it. It's great and fun that the band played wedding music the last half of the night but it would have been nice to have some current dance music played for the rest of us. We didn't know that half of OUR night would be devoted to their special night - really, truly the restaurant should warn diners that there's a wedding happening when we make reservations. It's not fair to the rest of us who have something to celebrate, too. It was really uncomfortable, to the point that my guests were all confused and complaining. Imagine going to a birthday dinner and ending up in the middle of a stranger's wedding?? We got knocked around the dance floor by the wedding party who felt it was theirs. I feel cheated out of a birthday celebration. If I was more petty, I would ask for a partial refund - and I'd deserve it. Our table was extremely crowded and uncomfortable. They packed our large table right next to another large table which was RIGHT next to the wedding party. Not a good customer experience. The food was also not good that night - kabobs were all overcooked and chewy. Appetizers were very good, but there was NO dessert at all. No tea, no coffee, no nothing after dinner. Service just sort of ended. They didn't tell us it was a fixed menu ahead of time so I ended up paying over $600 for an experience that absolutely should have been half that price. Service attentive and accommodating, but food only average. Chicken kabobs were overcooked and dry and served with large amount of rice. At least 4 items on their wine/beer menu were not available. Quiet for conversation only because restaurant was fairly empty on a Sunday night. I would not return. Excellent food and service. Staff is very friendly. Nice atmosphere. Excellent live entertainment, delicious food and exceptional service. Special thanks to Mike, Aida and their waitstaff. The ambience is good and quite. I did try buffet and the food is good, however the service is quite excellent. Firstly, the air conditioning was turned up high and our table was under a vent so we were all very cold. The service was slow and the server was never around when needed. I ordered a chicken kebab and the chicken was rubbery. I couldn't send it back because we couldn't find the server. At the end of the meal a manager came by and I told him about the chicken. He did take it off the bill. While we were eating they seated a party of about 20 people next to us. The younger children were put at their own table near us and proceeded to talk loudly, sing and run around with no supervision from the adults. All I wanted was a nice quiet meal with my family for Father's Day and unfortunately it didn't meet my expectations. There was a group of 12 of us to celebrate my husband's and his twin brother's birthday. The food was fantastic as usual, Service was great, and we had so much fun dancing to their live music. It was a memorable night for all of us. I would definitely recommend Arya Global Cuisine to anyone who's looking for great food and service. service was very good. the owner keep coming back to check on our table make sure everything was taking care!